Legendary Amazons first caught my eye while I was perusing the DVD shelves at my local Wal-Mart, and based on the cover alone, I thought it looked kinda cool. What’s more, it was produced by the great Jackie Chan, so at the very least I was expecting this film to be a bit of fun. And Legendary Amazons is fun. But you have to be willing to meet it halfway. 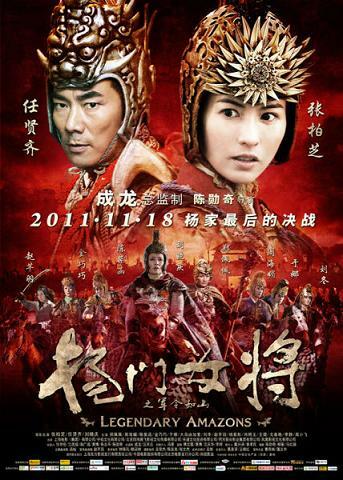 Set in ancient China, Legendary Amazons focuses on the Yang clan, renowned warriors who loyally serve the Empire, defending its Northern borders from the invading Western Xia army. But the war has taken its toll on the Yangs, claiming the lives of most of its men and leaving only the women to carry on their proud tradition. Yang Zongbao (Rochie Jen), the husband of Mu Guiying (Cecilia Cheung ), is believed to be the most recent casualty when its reported he and his troops were decimated by the superior Xia forces. Left with no other choice, the Emperor and his Prime Minister (Wu Ma) turn the army over to Wenguang (Xiao Mingyu), the inexperienced son of Zongbao and Guiying. Not willing to sit back and allow yet another of their men to perish, each and every female in the clan, including Guiying, her mother (Liu Xiaoqing), and even the elder Taijun (Cheng Pei Pei) decide to accompany Wenguang on his mission, vowing to fight alongside him every step of the way. A remake of the Shaw Brothers’ 1972 action flick The 14 Amazons, Legendary Amazons begins well enough, showing us the battle in which Zongbao’s forces are defeated. This is followed immediately by a flashback scene (mostly comedic in nature) where Guiying recalls the circumstances under which she and Zongbao first met. Next, we’re introduced to what I’m guessing are 14 female warriors of the Yang clan (I can’t say for sure, though, because I lost count after a half dozen or so), complete with intertitles telling us each one’s name and weapon of choice. We meet others as well, including a large number of the clan’s faithful servants, and it’s here that the film’s first real weakness shines through: there are far too many characters! So many, in fact, that I couldn’t keep track of them (with all the supporting players floating around, I was never sure who was who, which made it hard to care whenever one was killed in battle). Another issue I had with Legendary Amazons was its sketchy CGI (In the opening melee, boulders are launched via catapults at Zongbao’s stronghold, none of which looked particularly convincing when they came crashing down). Also, if you’re not a fan of wire work, then you'll definitely want to avoid this movie. During practically every fight scene, the combatants flip and fly all over the place, often for no good reason (some hand-to-hand skirmishes are dragged out because the participants spend so much time leaping through the air). Still, the action is entertainingly over-the-top, and there’s more than enough melodrama to keep us watching in-between the battles. Legendary Amazons may come up short when compared to such 21st century offerings as Hero, House of Flying Daggers and 13 Assassins, but as mindless action films go, it will surely give you your money’s worth.